If you love the sights and sounds of the sixties and seventies, then a trip to the beach with NetEnt's Wild Water slot game is a must. Taking the retro theme and showing it off alongside a host of modern iGaming features, this video slot is a perfect example of how the best casino games can be stylish as well as profitable. In fact, if you care to join us for the next few minutes, we'll take you through the finer points of this game with our exclusive Wild Water slot guide. 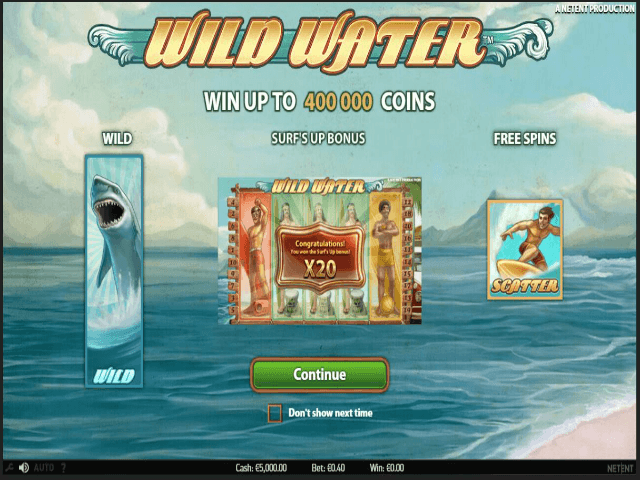 Play Wild Water Slot Demo for Free! Play Wild Water for Real Money! Wild Water doesn't really have a central story for you to latch onto, but there are plenty of colourful characters for you to get to know. 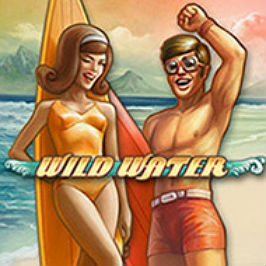 By using cartoon-style surf scenes with a retro vibe, Wild Water has a touch of the "teen beach movie" vibe about it. 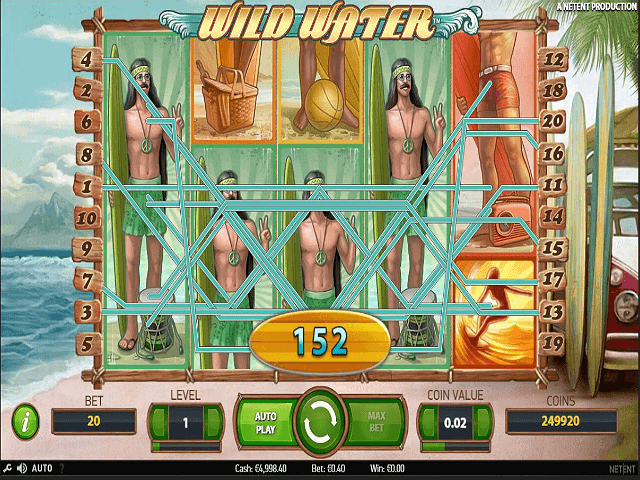 This design certainly gives Wild Water a charming edge, but today's top video slot games can't simply rely on looks to get by. Fortunately, the software provider NetEnt knows this all too well and has made sure there's enough substance to go with Wild Water's style. To dig in, you need to spin the reels and that means placing a bet. For the laidback dudes and dudettes who want to take it easy, Wild Water's five reels and 20 paylines can be spun from as little as £0.20. For the cool cats that want to spin and win a little more, the maximum bet per spin is £100. Regardless of the stakes you play for, the Wild Water payout table always offers the same promise. Because each prize is based on a multiple of your stake, the ratios stay the same regardless of what you're betting. Of course, the actual cash amounts you'll bank will differ, but it won't matter if you’re a minor bettor or a high roller, the payout table will still furnish you with wins, ranging from 5x to 2,000x your line bet. 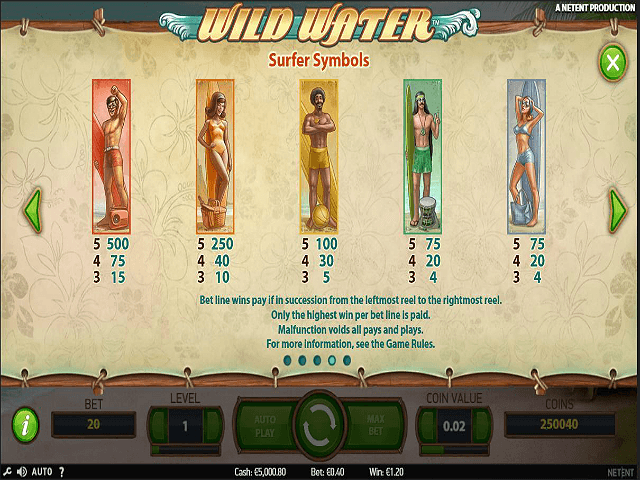 Like all the coolest video slots in town, Wild Water is awash with special features and symbols. For instance, if you roll in the shark wild, this symbol will substitute for all others except the scatter. Beyond this, three or more scatters will release a cash payout worth as much as 60x your line bet, as well as series of free spins. Finally, to make Wild Water just as lucrative as it is attractive, there are two bonuses filled with ways to win. That's right, if you can roll in any mix of surfer symbols across five reels, you'll activate a 20x bet multiplier. If you can match five unique surfers across the five reels, you'll increase the bonus to a 200x multiplier. When you combine this bonus with Wild Water's prize potential, you could surf into the sunset with a prize worth 400,000 credits! That's a serious amount of credits by anyone's standards and one of the reason's Wild Water has become one of the top spinners in the industry over the last few years. If you're looking for a slick retro slot with plenty of payout potential, take a dip in NetEnt's Wild Water. Share this Wild Water Review today! 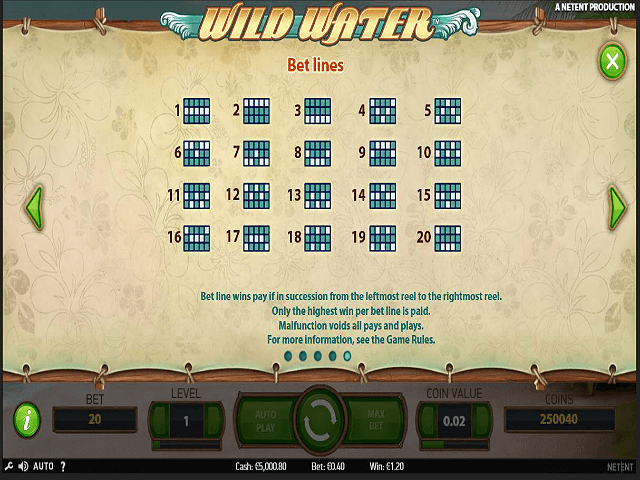 If you like Wild Water, you'll love these slot titles too!